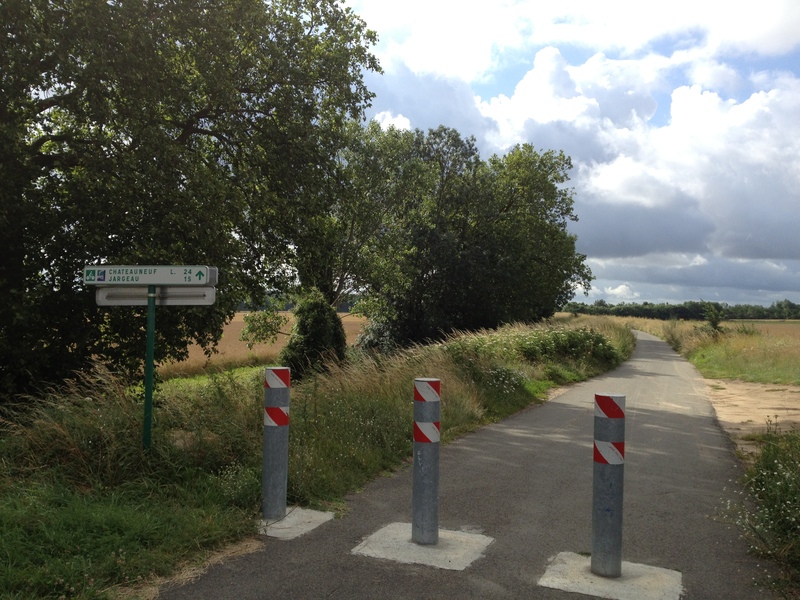 There supposed to be a cycle way (veloroute) running all the way along the Loire river. After a few kilometers from Orleans we found the route. It was a nice, paved, dedicated path running parallel to the bank of the Loire river. The weather was quite pleasant, with the wind blowing from the SW at 20km/hr. We cycled non-stop to Chateuneuf-Sur-Loire, some 31km from Orleans where we stopped at Le Port cafe for lunch. Light lunch turned into a three-course gourmand meal 😉 A thundery shower poured quite a bit of rain while we were inside the cafe. It passed over us in the direction of Sully. Leaving Chateuneuf the cycle way turns into an unpaved gravel track. It was quite hard to cycle on it, we turned left and joined D60 to Sully-Sur-Loire. In about an hour we caught up with the shower cloud that was slowly drifting SW. 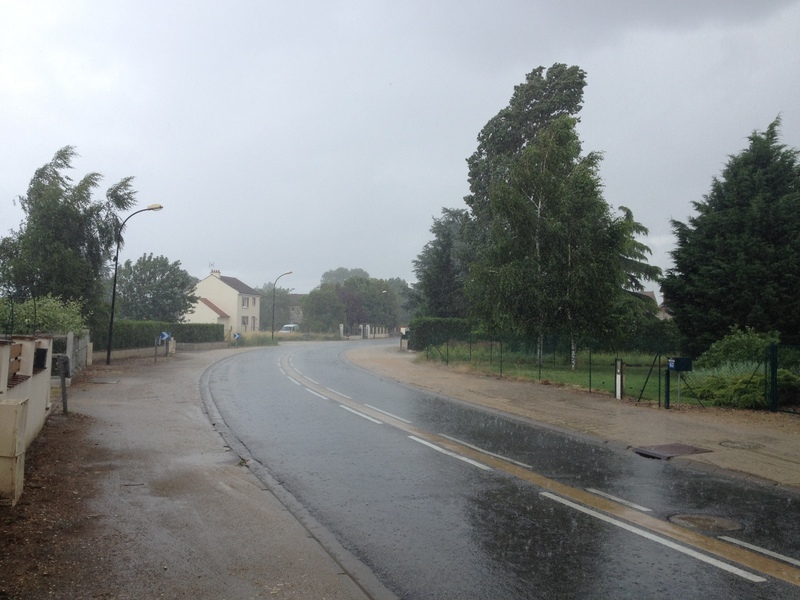 It started to rain pretty hard and we had to stop and hide under a tree at Saint-Benoit-Sur-Loire. Saint Benoit is home to a very beautiful basilica – Abbeye de Fleury, the flower abbey. 20 minutes later we cycled into Sully Sur Loire. Today was the flattest day of them all. We managed to only do 50 meters of climbing. Sully is quite a large village, the largest village we have seen so far. 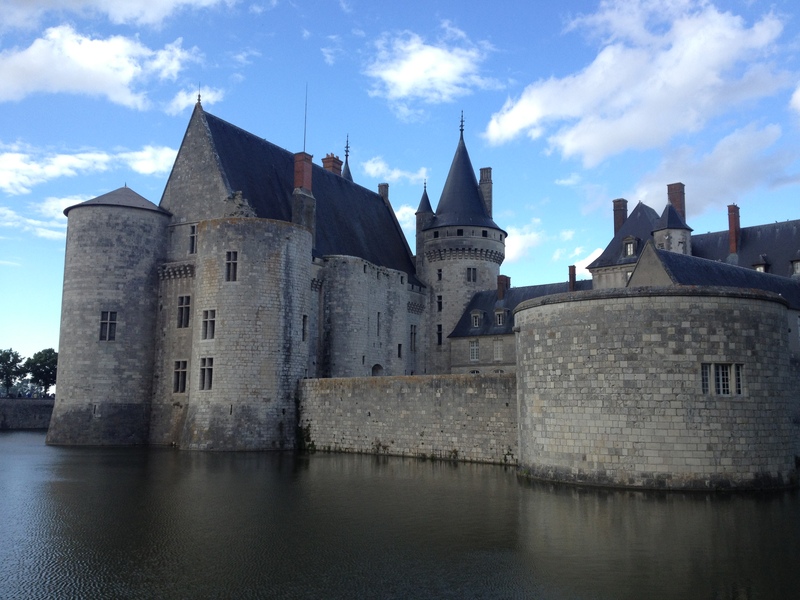 There is a beautiful chateau in the village – the Chateau Sully.